Servers | KGS | Unlucky "aggressive"
and it's hard to control him. 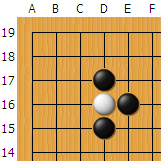 Black was behind, but his central invasion was very successful. But suddenly ... Black lost the game by time. of killing White's group on the top. "aggresssive", 8-dan was so unlucky!